Are Fleas Aggravating Your Dog? With summer in full swing, your dog is going to be outside enjoying the weather. Unfortunately, dreaded fleas can put a damper on all that fun time. 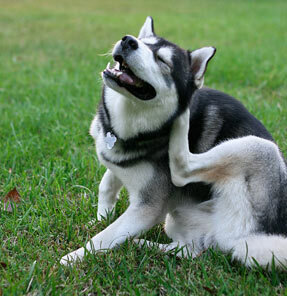 According to Pet MD, there 10 ways to stop fleas from biting your pooch! These year-round tips can keep your dog from itching and catching serious diseases! Clear the Yard–Trim your lawn, trees, and bushes on a regular basis. Flea Traps–You can purchase flea traps, or make homemade versions. Household Spray & Foggers–These will help keep kill adult fleas, as well as larvae and eggs as they hatch. Clean House–Clean your house on a regular basis, and if you already have a flea infestation, you will need to clean every day until the fleas are gone. Powders & Sprays–These are inexpensive ways of repelling fleas, but they need to be applied on a more regular basis than other prevention methods. Flea Dips–These are used for severe infestations and should not be used on a frequent basis. Flea Collars–These can be effective if used for the right type of flea. The collar needs to have frequent contact with the dog’s skin. Flea Shampoo–This is an inexpensive way of protecting your dog year-round, but your dog needs to be bathed every 2 weeks in the shampoo. Oral Medication–It will work to disrupt the life-cycle of fleas, but does not kill adult fleas on contact. Spot-On Treatment–This will cover the dog’s entire body, and is effective for several weeks. Keep your pet safe when traveling with a car seat from Snoozer™. You can allow your pet to ride right next to you with the Pet Lookout® Console Booster Car Seat, or in the seat next to you with the Pet Lookout® Car Booster Seat. Both of these seats are made of firm, quilted nylon polyurethane foam. You can choose from a variety of colors for the exterior. Each car seat has safety features that allow the seat to be securely strapped into your vehicle so that your pet can enjoy the outside view. Each is also equipped with a safety strap that can be used with your pet harness. These car seats are a great, unique way to keep your pet safe during your travels!